Sugar is the historic stalwart for all sweet tasting foods. Naturally, people enjoy its great taste. However compared to human body weight levels from 1960, both men and women are now 20 pounds heavier on average, while neither gender is more than an inch and a half taller. The disproportionate increase in human body weight has created issues that are driving widespread innovation and the sugar industry is no exception. Research from the Harvard School of Public Health has recently tied sugary drinks to an epidemic of obesity in the United States. Harvard's Department of Nutrition, in a widely covered press conference, has challenged beverage makers to create a class of drinks with 70 percent less sugar. The U.S. Department of Health believes that this reduction would significantly lower obesity rates within a year. The major challenge for food producers is that product choices are typically shaped by longstanding habit and ingrained preference that one's favorite food consistently tastes the same. One only has to remember the major product blunder that occurred when Coca-Cola changed its historical formula which was familiar to all its drinkers. Meaningful changes in core ingredients for food products require laboratory activity. The large food manufacturers have huge contingents of chemists, scientists, and nutritionists constantly seeking solutions to concerns created by emerging awareness. Why is Sugar Content So High? Originally the public was concerned with consuming too many calories. Concern then shifted towards reducing fat and salt intake. While these areas were of major concern, food producers often solved the problem by substituting sugar to add flavor. With this approach, any health benefits that might have been achieved with a reduction in salt and fat have been offset by an increase in sugar. Sugar substitutes are replacements for sugar which imitate the taste of sugar but often without the calories. The world consumption of sugar substitutes has been rising at least 1 - 1.5 times faster than sugar each year. This growth in consumption may be due to increased awareness of obesity, diabetes, and other health concerns that cause people to search for calorie-free alternatives. The chart below summarizes the characteristics of sugar in comparison with other sweet tasting alternatives. Diabetes is characterized by high blood glucose levels which are caused by deficiencies in the capacity to produce and/or respond to insulin. This hormone, produced by the pancreas, is fundamental to the conversion of sugar into energy. Many artificial sweeteners such as saccharin, sucralose, and neotame cannot be broken down by the body. Therefore, they pass through our system without causing a spike in blood-sugar. For this reason, artificial sweeteners provide a good sweet-tasting alternative for many diabetics. Historically, non-diabetics enjoyed them as well since they are generally calorie-free. Although artificial sweeteners are generally free of calories, recent studies suggest that they may actually compound the problem they are designed to combat. Scientists at Perdue University conducted a study in which they fed yogurt sweetened with zero-calorie sugar substitutes to rats in one group and the other group of rats' diet was supplemented with glucose, a natural high calorie sweetener. The study revealed that the rats in the first group gained more weight and consumed more calories than the rats in the second group even though the sweeteners in the first group were calorie-free. Some scientists believe that the same effect occurs in people. A 2005 University of Texas survey found that people who drink diet soft drinks actually gain weight and for every can of diet soda consumed, the chance of being overweight increase to 41%. Examining 30 studies, The American Journal of Clinical Nutrition found there is a positive association between sugar intake and weight gain/ obesity. Dr. Lustig, a leading specialist in pediatric hormone disorders, says "It's not about the calories . . . It has nothing to do with the calories. It's a poison by itself." Lustig also states that "sugar should be thought of like cigarettes and alcohol, as something that's killing us", which many other specialists agree. This awareness has led to a shift from a focus on fewer calories towards a focus on natural, wholesome alternatives. Sales are soaring in the natural food market. The NY Times estimates that 39% of household shoppers are searching for a natural sweetener and this number may be rising. As consumers strive for more natural and less altered food products, researchers strive for an all natural, sweet tasting, and low calorie sugar alternative. There are almost one hundred natural calorie-free sweeteners. Most of them come from plants. Stevia is a natural, non-caloric, sugar substitute made from the leaves of a Paraguayan shrub. It allows diabetics to enjoy a sweet sugar-like taste without causing a spike in the blood sugar level. Although it is all-natural it has one major flaw, namely its bitter aftertaste. Scientists have proposed solutions through genetic engineering. Changing the ratio of the acids gives the natural sweetener varying tastes and can largely eliminate the bitter-aftertaste. But can scientists use these products to imitate traditional tastes and satisfy long-standing preferences? Industry leaders have made significant progress towards this end. As part of its commitment to improve the nutritional profile of its products, Nestle has reduced the amount of table sugar in its products by 32% from 2000 to 2013 and they are committed to a further reduction of 10% in certain products by 2016. Industry leaders such as Nestle are not timid to invest the money to accomplish these ends either. Nestle boasts of having the largest food and nutrition research network in the world employing 5,000 people in their research and development network and investing over $1.5 billion in R&D throughout 2013. Another industry leader, General Mills, is striving to take lead in their competitive food categories. General Mills is actively researching ways to reduce the sugars levels of their cereals while maintaining their taste. 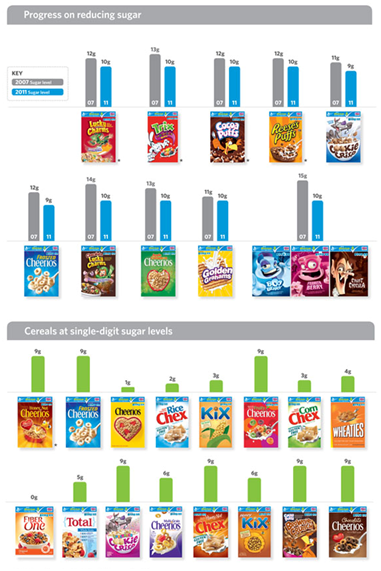 General Mills reduced sugar levels by more than 14% since 2007 and demonstrates their progress in the chart below . Nonetheless, food producers still face many challenges ahead. Sugar is considered an essential ingredient in most food products, it is prevalent in soft drinks, bakery products, and ice cream. What many people don't realize is that sugar is also an essential ingredient in most packaged and canned food items since it also doubles as a preservative, adds texture, and alters color. Slight reductions and replacements in the ingredient then creates far-flung effects. Scientifically tweaking the ratios in the sugar/sugar substitute compounds to achieve optimum satisfaction is no easy task. Reducing the amount of sugar in food products is daunting because the products consumers have come to love have already been tweaked by manufacturers in such a way that "hooked consumers on their products the same way the cigarette industry hooked smokers on nicotine" says Pulitzer Prize-winning journalist Michael Moss in his book Salt Sugar Fat: How the Food Giants Hooked Us. As the nicotine crisis is underway, Phillip Morris accurately predicted the sugar problem. In their previously owned food division, Kraft, Phillip Morris officials predicted an obesity problem related to salt, sugar, and fat that would be "the same magnitude, if not more than [what] we're facing with nicotine right now." Emerging awareness of the health effects of high sugar content creates challenges to food producers. Researchers should be aware of the federal and state R&D tax credits which are available to help shoulder the costs of creating innovative solutions.